Those dazzling displays of flowers aren't magic. They're the result of months and months of growing in right conditions. Orchids need time to build up the energy to make those magnificent blooms. You'll get rewarded with big blooms if you give your orchids what they want during their growing season. Successful growers create special "growing areas", where their plants get what they need for healthy growth, and they're rewarded with big blooms. Unlike houseplants, who are generally happy with their surroundings year round, orchids expect varying conditions throughout the year. In their natural habitat, most orchids experience hot, steamy, tropical weather during the summer ( their growing season), followed by cool, dry periods in the winter (their blooming season). Temperatures can vary from the high 90's in the summer to the 40's and 50's during the winter. Rain showers are common almost every day in the summer, but they can be weeks apart in winter. 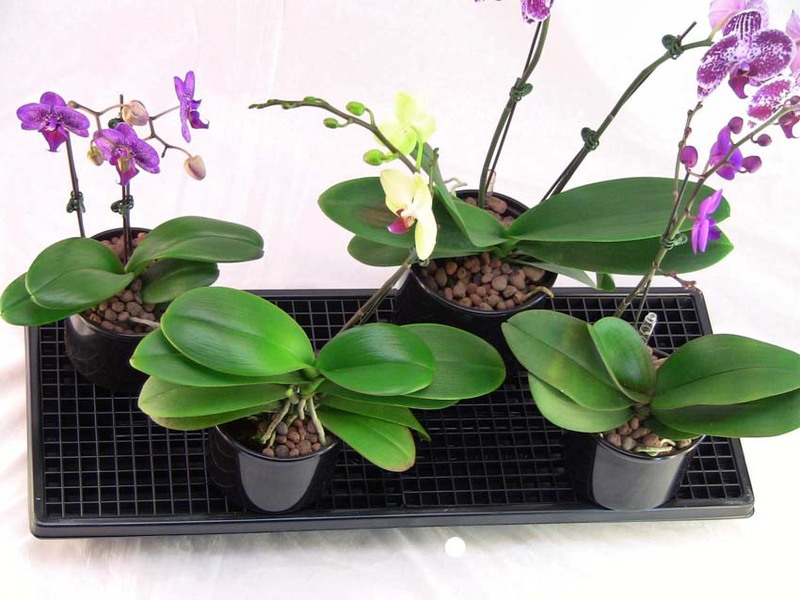 What growing conditions are your orchids looking for? Lots of Light - Orchids need energy to bloom. The only place they get energy is from light. Varying Temperatures - Most orchids need at least a 15-20 degree difference between day and night temperatures to trigger a bloom cycle. They simply won't bloom without it. Adequate Humidity - Orchids can't tolerate dry air. They don't need a rain forest but they do require at least 20-30% realtive humidity. This can be a challenge during winter months. Successful hobbyists create special "growing areas" to create these conditions for their plants. The fundamentals for a growing area aren't complicated. Where can you find a place in your home that has good light, varying temperatures, and adequate humidity? It all has to do with micro-climates. "Micro-climates" are small areas that are hotter/colder, wetter/drier, or sunnier/shadier than the surrounding environment. Your home has many micro-climates, especially around windows. These areas are generally brighter and hotter/colder than the rest of the room. You may not notice this - but from an orchid's perspective this can mean blooms or no blooms! 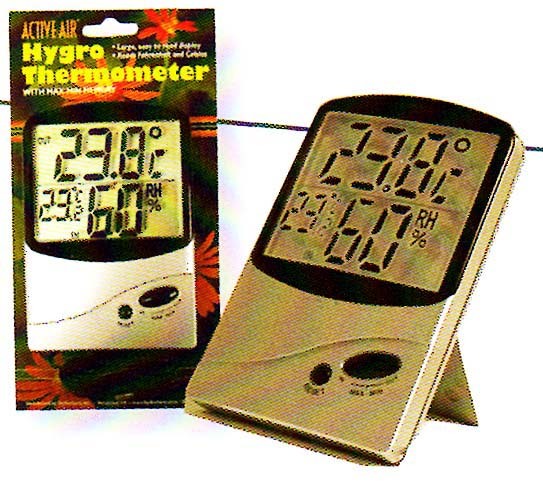 The best way to understand the micro-climates in your home is with our Hi/Lo Thermometer. "When you stop guessing and start measuring you'll become a better grower!" Pick a window. Using the compass in your phone, determine what direction the window is facing. East and west windows have good light during summer months, but they don't have a lot of light during winter months. South windows are shady in the summer but get hot and sunny in winter. Direct, intense sun (in any window) can burn leaves. 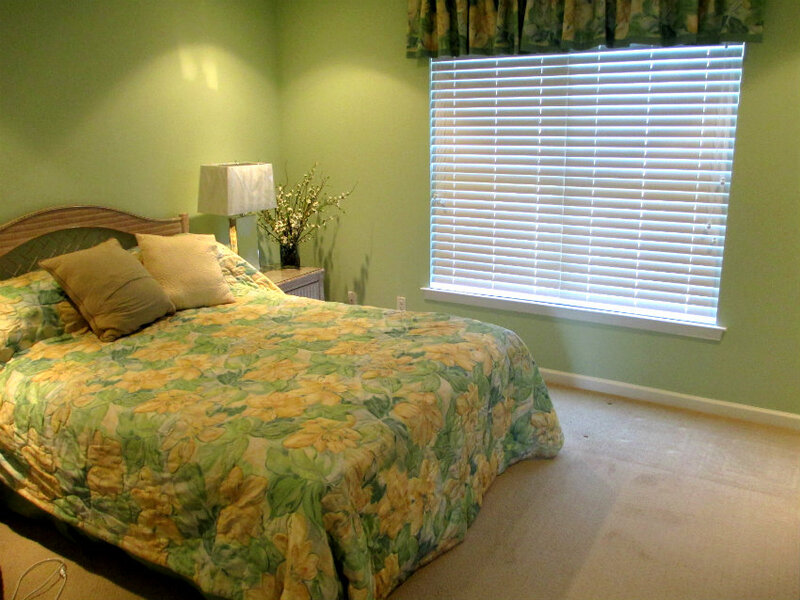 Shear drapes or adjustable blinds are helpful if the window is in hot with lots of direct sun. Of course trees, awnings, etc. will also effect light levels. Temperatures in the micro-climate around windows can vary widely. A sunny window can reach 100 degrees or more - even in winter! That same window can drop to 60 degrees or lower at night. That's a 40 degree difference ... perfect for orchids! Temperatures in your growing area can be further controlled by shutting off the heat vents at the window. Don't worry, your plants won't be too cold. If shutting off the heat vents doesn't work, try installing heat deflectors over the vents. This will deflect the hot, dry air from the furnace away from your plants. 1. Grouping plants together on humidity trays. 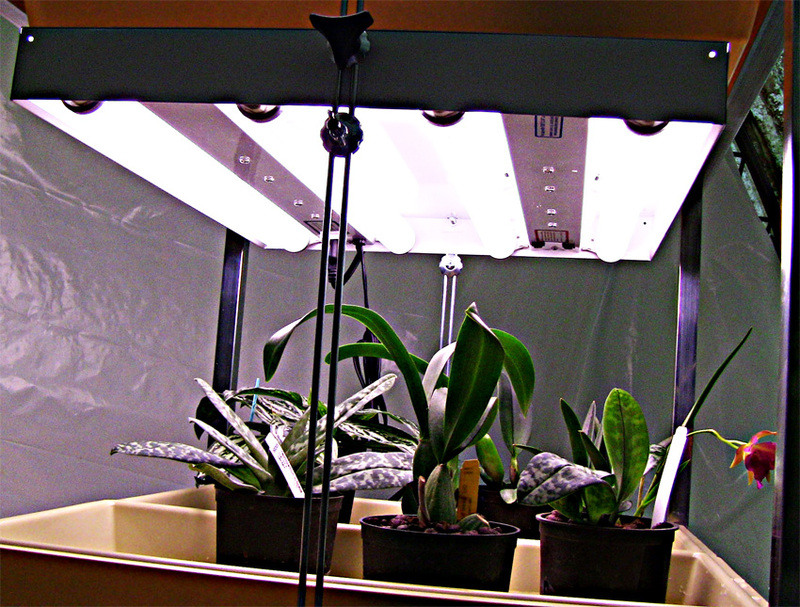 Moving plants together naturally increases humidity. 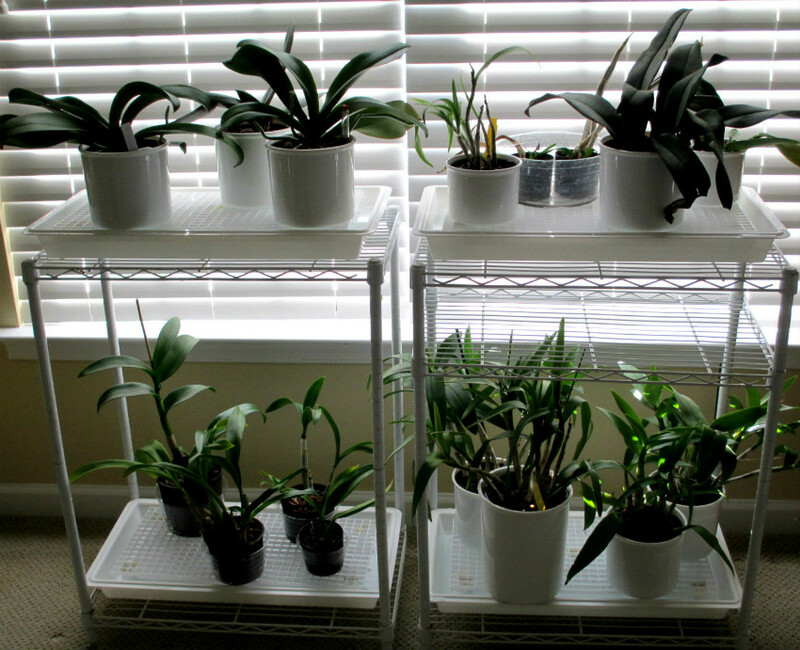 Adding humidity trays under your plants gives the humidity levels a real boost. As the water evaporates from the trays - humidity levels around your plants go up. 2. Turn down the thermostat a few degrees. Humidity levels are closely tied to air temperature. Air from your furnace is extremely dry. To promote higher humidity, try turning down the heat a few degrees, especially at night. Both you and your plants will be healthier! With plant lights the sun shines everyday! Spare bedrooms or guest rooms are excellent for setting up a growing area. Simply close off the heat and air conditioning in the room and close the door. 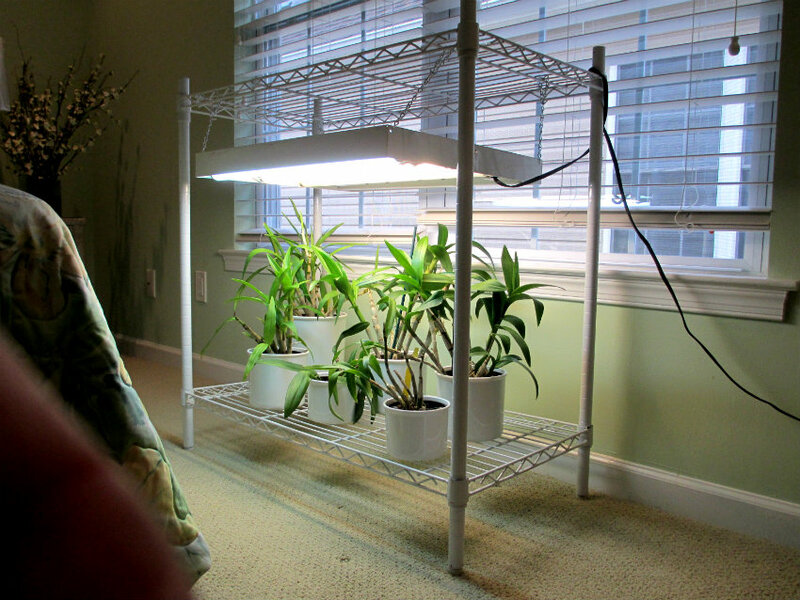 The sun will gently warm the room during the day and your plants will love the cool nights. Closing off heat vents eliminates the hot, dry air from the furnace and automatically raises humidty levels. Don't worry, your plants won't complain about being too cold. Give your indoor growing area some thought. 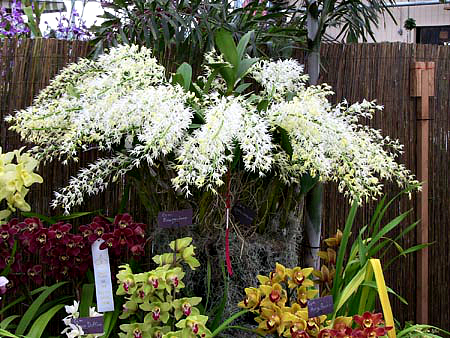 Your orchids will be happy and you'll be rewarded with magnificent blooms!